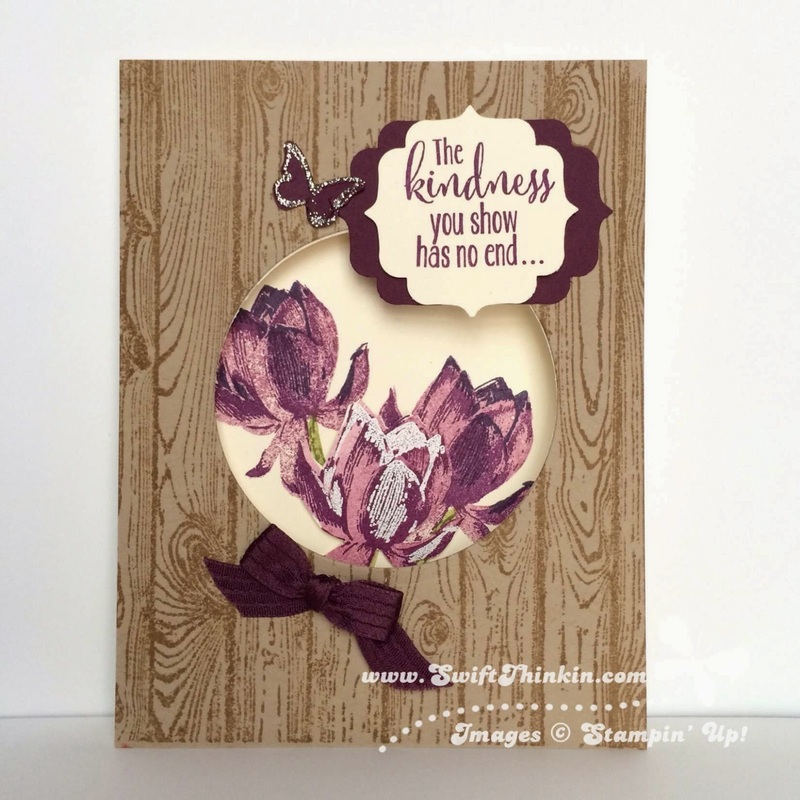 One of the FREE stamp sets you can earn during Sale-a-bration this year is a beautiful two-step stamping set called Lotus Blossom. If you've never heard of two-step stamping before, it just means that the stamps are made to layer over each other (actually, the flower from this set has three stamps- but the name is still the same :) ). And with the new photopolymer stamp sets this technique is easier than ever! 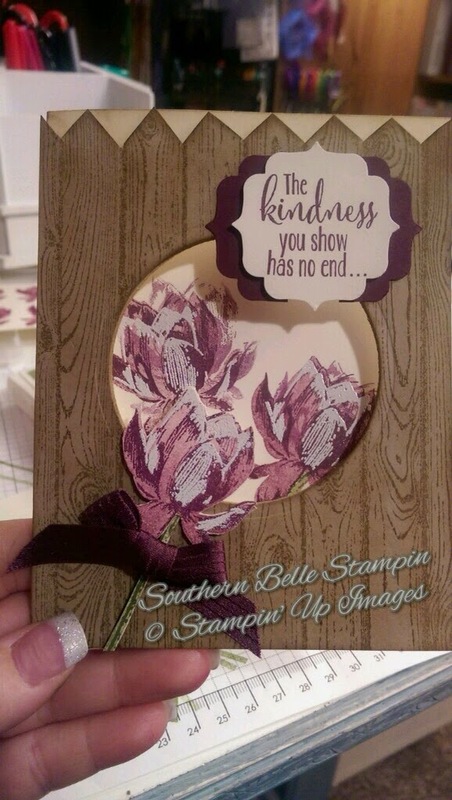 During our Diva Swap I received two gorgeous cards using this stamp set. 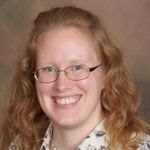 The first was from Tara Jeffries, who I would like to introduce to you. Tara, is going to let you know all about her card! HI Ya'll, It is my pleasure to share with you the card that I made for our Diva Swap. As Amber mentioned above it is the Lotus Blossom Sale-a-bration set. With this card I stamped the background paper, crumb cake with the wood grain stamp, and then used the circle thinlit dies to cut throught the crumb cake layer and the front layer of a standard size card. This way the circles would line up perfectly. When you open the card you will see that the lotus image has been stamped on the inside twice and then one of the lotus blossoms were cut out an layered as the third flower. You will also notice that you can see 3 colors of ink on two of the flowers, and then on the cut blossom you will notice a white stamped image. Instead of using ink, I heat embossed the last layer to give it a highlight. Now of the card below I did a stepped up version. With this card, I cut the top of the card to mimic pickets like a fence. 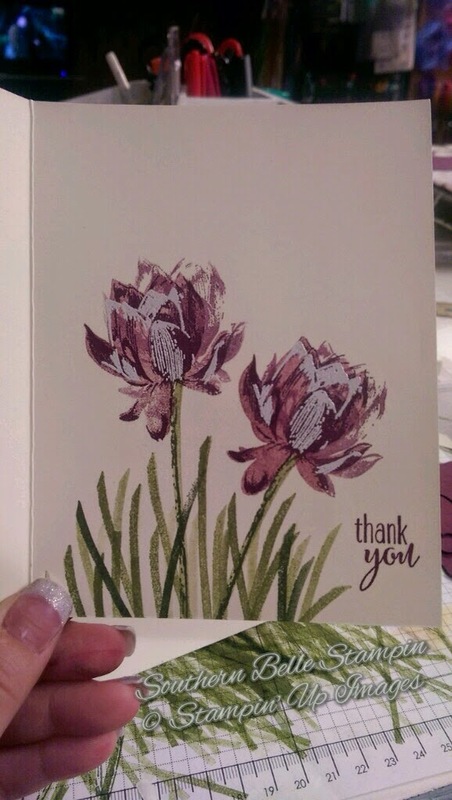 I also embossed the third step on all three flowers and put the third one on the front of the card instead of inside. I used the stem to add blades of grass on both, and just love the effect that it has. I did put a butterfly on the stepped up card but that was after the photo was taken. Stepped up: just means that I took the same idea and just expanded it a bit with more details such as punches, bling, rhinestones,pearls, brads, glitter, etc....or added dimension to make it stand out more. Thanks so much Tara! You do gorgeous work :) If you want to see more of Tara's creations you can find her at the new blog.